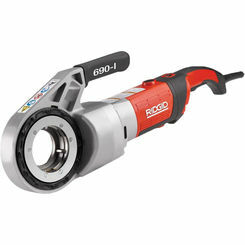 Reed 601PDKIT1 Hand Held Power Drive Pipe Thread Machine W/Vise &amp;amp; 3 Heads 1/2-1"
Many consider pipe threaders to be a plumber's best friend, and it's easy to see why. 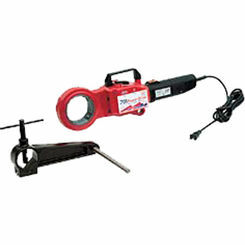 These power tools allow you to threaded various types of pipe so that you can make tight connections in your plumbing and gas installations. 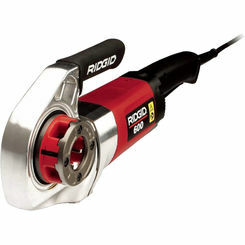 We also carry threading dies for your tool. 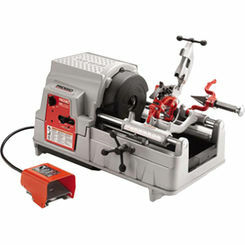 At PlumbersStock, you can save big money on Reed and other brand name pipe thread machines and get professional results with your home improvement projects. We also carry pipe threading dies and replacement pipe threader parts to keep your machine up and running at full capacity. What is a Pipe Threader? A pipe-threading machine is unlike any other power tool you’ve used before. 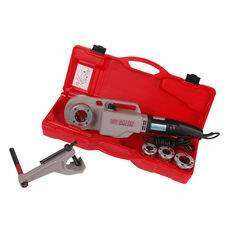 This tool allows the user to create threaded pipe used for various applications including repair jobs, plumbing installation, and electrical fittings. 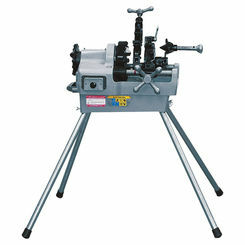 Threaded pipe is important in allowing tight, waterproof seals and connections in your installation and if you find yourself working with large amounts of galvanized pipe, stainless steel, or heavy-wall conduit and rod, a powerful threading machine will help you make the perfect fit threaded pipe for your application. Additionally, if you are the owner of an older home, you may need to thread pipe to update or repair your electrical and plumbing systems as needed. 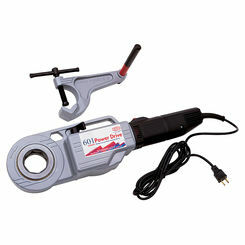 Here at PlumbersStock, we offer portable and inexpensive pipe threading machines to allow you to fix up your home yourself rather than call a professional. It can be difficult to create a good thread if you’re unsure how to work the machine or if something suddenly goes wrong. Knowing some basic troubleshooting tips can help you avoid making bad threads, as well as save you time, money, and effort in the long run. 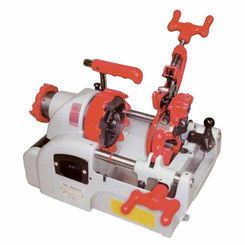 Electrical – The majority of electrical-based problems on a pipe threading machine is due to a loss of threading power. While irksome, this is usually easy to fix. 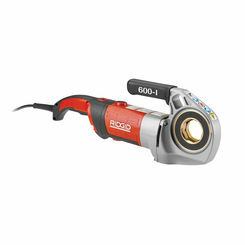 Powerful machines such as pipe threading machines are most susceptible to power losses when an extension cord is being used. While using an extension cord is sometimes necessary, avoid power surges by ensuring the cord is at least 12 gauge wire if 1-10 feet and 10 gauge wire if the cord is 10+ feet. Another common electrical problem has to do with how much current is being used. This is especially problematic on machines that run on 120 volts. When cutting thread, your machine’s current level will rise. While this isn’t a problem if your machine is alone on the circuit, if you have other machines on the same circuit you risk the chance of overloading the machine and even personal injury. Debris – Many common problems are caused by dirt and grit getting in between metal surfaces. While this may not seem like much of a problem, operating your machine dirty will cause rapid wear of the steel, causing smooth working surfaces to bind up and resulting in poor threads and eventual machine failure. Care should be taken to ensure your machine is clean, and one way to do this is to clean the material before it enters the threader. Lubricants – To ensure your machine performs the best it can, have a can of lubricating oil nearby when working. An occasional drop of oil on the ways can make all the difference and provide trouble-free operation for years to come. 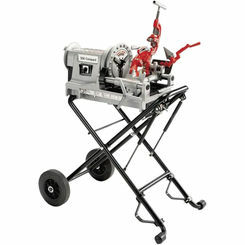 Carriage – Your threader will have two carriages, one below the die head and the other used to carry the material. On a normal machine, these carriages will begin to wear down, and the more wear they accumulate, the more likely you’ll begin to experience alignment difficulties. To counteract this problem, some carriages with flat ways come with adjustable gibs that can be tightened as needed to accommodate the extra wear. A proper threading machine is a great way to create threads yourself and save time and money instead of calling a professional. Good threads can be used for repairs in electrical and plumbing applications, and no one will give you a better thread machine at a better price than PlumbersStock. Save big on brand name Reed and get the pipe threading machine you want at a price you can afford. Find out why so many others choose us for tools and take advantage of our wholesale prices!